Value Store It Manager collects donations for local women’s shelters in Hartford, CT. The Value Store It Manager in Wallingford does a lot of work for charitable causes, and this time she got customers at Value Store It involved. April collected donations for The 3rd Annual Hard Roller Polar Run & Pub Crawl, which benefits local women’s shelters in the Hartford Area. Value Store It customers in Wallingford, Connecticut have been extremely supportive and have made many donations. Thanks to the combined efforts of many people, April collected a large box full of charitable donations from Value Store It customers and staff that are needed at the shelter. The Hartford Area Roller Derby (HARD) is organized exclusively for charitable purposes, more specifically to organize and promote Women’s Fast Track Roller Derby in the Greater Hartford Area of Connecticut. HARD’s primary purposes are to foster the skills and athleticism of roller derby and to promote teamwork, respect, empowerment of women, and to build a community. 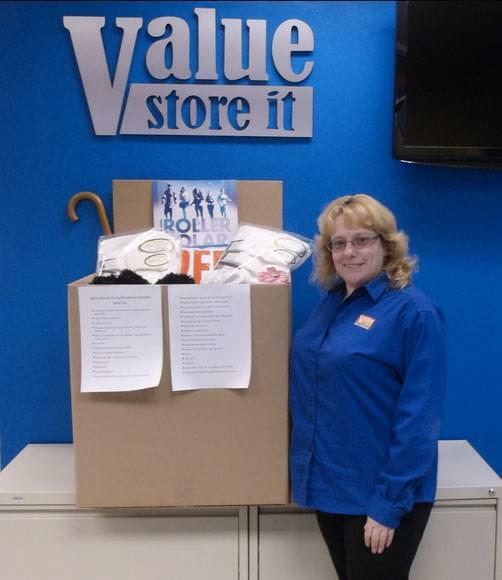 April is the Manager of Value Store It self-storage center, which is located at 513 Main Street in Wallingford, CT. You can learn more about the company or other charitable causes by contacting us or calling by phone at 203.265.3300. April’s work for charitable causes was recently highlighted in an article in The Advisor, a local newspaper in Connecticut serving North Haven, Wallingford, and the surrounding area.